To reform a house for a dependent elderly person is a challenge. In the next articles I will reveal useful indications to carry out all types of changes that can be carried out in a home and at the same time to comply with the new stringent Spanish regulations on accessibility. 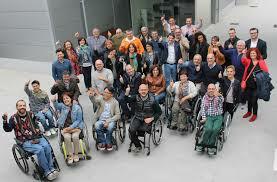 To reform a house depends on the characteristics of the dwelling and the degree of loss of autonomy and the type of disability of the person living there. Before embarking on major projects, it is a good idea to think about what one can do (there is always someone with special skills in the family that may help) without having to resort to a construction professional: for instance, to install a simple handrail by a steps, placing pull handles in a bathroom or fix the carpets to the floor with adhesives so that they do not slip are very simple operations. In specialized stores we can find many accessories that will be useful. 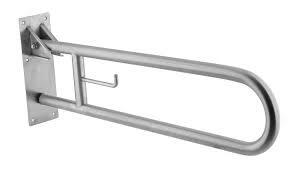 There is also the possibility of renting special equipment, such as articulated beds or walkers. You have to let yourself be guided by common sense. For example, a person with difficulties to walk about may find more useful a chair or a rigid armchair better than a soft sofa in which one will sink and from which it is almost impossible to rise without the help of another person. - The cables must not be on the way. At the beginning and at the end of some stairs. At the head of a bed. At the beginning and end of a corridor. - Two ways switches are preferable, which allow the lights to be turned on and off from different places. It would be convenient that they were phosphorescent or with a luminous led that allows them to be located in the dark. They must be placed at 90 centimetres or one meter from the floor. - The number of plugs must be sufficient to avoid extension cords. It is best if they are located at the same height as the switches or, at least, at a distance above the ground of 40 centimetres. - The ideal is to have light sources that can be oriented to avoid glare and adjustable intensity, in order to adapt the brightness to the needs of each moment. - They must be smooth, non-slip, without protruding elements (as sometimes happens in access to terraces and balconies). - Try to eliminate the carpets or, if you have them, make sure they are not bent, that they do not move easily, etc. - If there are steps, they must be marked and have elements that help to cross them. - Carpet that are not too thick are the most recommended. It has been shown that fewer fractures of the femur neck occur with it. Whenever possible, it is better to choose a carpet with a rubber or felt underside, which serves as acoustic insulation and reduces the risk of fractures in the event of falls. 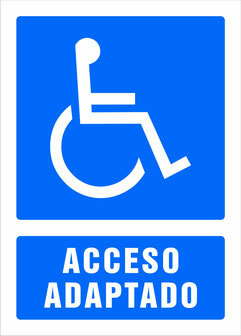 - However, please note that carpet is an inconvenience for those who move in a wheelchair. - Wooden floors are safer treated with non-slip waxes. - Put aside the furniture or objects that hinder the passage. - Avoid objects such as cables, toys, etc. be in places of passage. If necessary, the cables should be fixed to the wall. - As far as possible, the edges of the furniture should be rounded. If a wheelchair is necessary, it must be foreseen that it can move around the house. - Electric devices for raising and lowering blinds are more comfortable and safe. 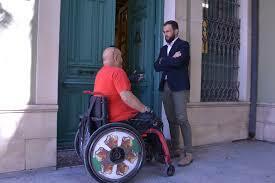 - The doors should be wide, especially if a wheelchair is needed for travel. - Doors of at least 80 centimetres are recommended. The optimal width of 110 centimetres with two leaves, one of 80 centimetres and another narrower, reserved for the passage of very bulky elements. - Chairs or armchairs with armrests and high backrest are very suitable. - The armchair is preferable to the sofa. - The seats should not be too high or too low because that would make it difficult to sit or stand up. There are available automatic armchairs that lifts the seat up to help the person to stand up without much effort. - The seat must be high enough (45 centimetres); The backrest is straight and has arms rest to facilitate standing up. A reclining backrest and footrest add comfort. - The television must be equipped with a remote control. Wireless headphones will allow you to listen without raising the volume too much in the case of hearing difficulty. - Cordless telephones prevent the person from rushing towards the device every time a call is made, reducing the risk of falls. - As far as possible, in order to move around the bed, it is necessary to avoid placing one of its sides next to the wall. - It is not advisable to orient the bed towards the window, particularly in the case of people with vision problems, because the morning light can dazzle them. - The bed should not be too high or too low, so that it is easier to get up and go to bed. The minimum recommended height is 45 centimetres. - To adapt the height, you can change the legs of the bed base or use shims. - The light switch, telephone or remote alarm must be easily accessible from the bed. The bedside lamp should be as stable as possible. In fact, the ideal would be to replace it with a wall lamp. - The floor mat must be fixed to the floor with double-sided adhesive, although it is most effective to suppress it. - Use an air mattress or those similar to a mattress (mattress size or cushion size) in people with great immobility. Its use relieves the back or other parts of the body and prevents aches and ulcers from developing decubitus (ulcers of the skin that occur when the body is supported on a surface). Cushion-size mattresses can also be used on the chair or in the wheelchair. - Also use protectors for the skin (sheep skin). Its function is to reduce or avoid the consequences of friction of those parts of the body that for certain reasons (protruding bones, postures, etc.) can reach sores (pressure ulcers) and / or pain. - Sheepskin can also be used on the chair, in the wheelchair, etc. Articulated bed. In those cases, in which the person suffers a high dependency and cannot alternate the periods of stay in bed with small walks or breaks in an armchair, the articulated bed will avoid absolute immobility and facilitate the change of positions, from the decubitus to sitting (sitting posture). - It is necessary to make adaptations that allow the dependent person to continue using the kitchen. The sink should not be too deep, the tap with lever avoids the twists of the wrist and if it is of the removable shower type it allows to fill the pans without needing to place them in the bottom of the sink. - The shelves must not be too low or too high: their ideal height is between 40 and 1.5 meters above the ground. The most used utensils should be placed in the most accessible places. - One of the main dangers lies in the risk of burns caused by different sources of heat. Electric stoves are preferable to gas stoves because they are equipped with a light that indicates their operation. However, ceramic cookers are the most recommended, because, thanks to its flat surface, it is easy to slide the pots over them. It is true that they are more expensive and for those who have difficulty seeing it is not easy to know what the cooking zones are. - The microwave allows to heat all kinds of dishes and prepare infusions ... Nowadays it is an almost essential piece. - A small table with wheels, known as "waitresses", allows you to safely transport the hot and heavier dishes. - Use stable chairs or stools. - It is preferred a non-slip floor. And above all. The elderly dependent must receive explanation and justification before any changes are carried out and should consent freely to those changes. Let's not forget, more often than not it is their home! !